The Earth-Moon system is constantly bombarded by meteoroids of different sizes, and their numbers are significant. By observing the lunar surface impacts, whose flux is similar to that of the Earth, we could obtain detailed information regarding their magnitudes, velocities, temporal and spatial distributions. 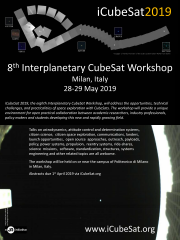 This information has applications in generating high fidelity solar-system meteoroid models, validating the existing lunar impact models, contributing to lunar seismology studies and interior modelling, and initiating a Lunar Situational Awareness programme for future exploration missions. The flashes produced by the lunar meteoroid impacts are observed currently from Earth-based resources, but they are restricted by geometry, illumination, and weather. The present work proposes a Lunar Meteoroid Impact Observer (LUMIO), placed at Earth-Moon L2, to observe, quantify, and characterise the meteoroid impacts by detecting the impact flashes on the lunar farside. This will complement the knowledge gathered by Earth-based observations of the lunar nearside, thus synthesising a global information of the Lunar Meteoroid Environment. The mission utilises a 12U form-factor CubeSat which carries the LUMIO-Cam, an optical instrument capable of detecting light flashes in the visible spectrum to continuously monitor and process the optical information. The mission utilises a novel orbit design technique and latest CubeSat technologies to serve as a pioneer in demonstrating how CubeSats can become a viable new tool for innovative planetary research and deep space exploration.